Calendula in bloom is a sight to see! What’s so amazing about calendula? Besides being a beautiful plant and brightening up the entryway to our medicine garden, calendula is a powerful healer by promoting cell repair and an antiseptic. It is often used externally for bruises, burns, sores and internally for fevers and for GI issues. We like to tincture it or dry it for use internally (avoid while pregnant) and for external use we like to make oils and salves. To make an oil with calendula, we recommend at least partially drying the flowers before making an oil as they have a high water content and can spoil the oil. A simple way to make an herbal infused oil is to place the dried flowers in a dry jar and cover them with oil (we prefer organic olive oil or jojoba oil). Cover tightly and place the jar in a warm spot and allow to steep for two to four weeks. Strain through cheesecloth. To make a more potent oil, you can then take a fresh batch of flowers and infuse those in the strained oil. To make a salve, on the stove top or in a crockpot add 1/4 teaspoon of beeswax to 1 oz of oil using just enough heat to melt the beeswax and evenly incorporate it into the oil. Use on cuts, bruises or wound, for dry skin or lips. 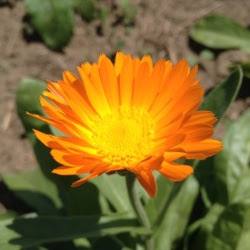 A fresh flower tincture of calendula can be used daily as a tonic for skin issues or for candida. Read more here in relation to treating candida. Cautions/Contraindications: Considered safe. Has long been used as a food.